What a technician needs to know about the types, the function, diagnosis and test methods of the common knock sensors. The use of knock sensors as a sensitive monitor for engine vibrations created by detonation can allow an electrical return signal to the PCM to trigger an ignition retarding condition that can vary the amount of retard so that detonation is prevented, and the engine performance is not inhibited. They are generally located as close as possible to the combustion area where the detonation vibrations are best monitored. The number of sensors vary depending on the engine design, from a simple single unit on an inline engine to a now common 4 units fitted to a V engine Toyota/Lexus for more accurate monitoring. Unfortunately, many of these units are in “hard to get to“ places that make it time consuming for testing / diagnosing / replacing, so it is important that only correct quality units are fitted as replacements. Types of common Piezo Electric knock sensors that produces an AC voltage based on vibration or noise. Mass Piezo Electric type – Picks up noise in an entire range of frequencies – this may pick up engine mechanical noises. Resonance Piezo Electric (typically up to 1000Hz) – Picks up noise that relates to detonation frequencies. Filters engine and other mechanical noises. Note: The Mass Piezo type knock sensor AC output signal can be simply identified visually on a suitable oscilloscope by using a metal bar or hammer and gently tapping near (not on) the sensor itself to simulate vibrations. This is commonly called an Active Test. The Resonance Piezo type knock sensor signal requires a specific vibration frequency and this method is not accurate. To minimise RF (radio frequency) noise affecting knock sensor operation, a shielded wire is generally utilised from the knock sensor to the PCM. This is generally on single wire sensors. The 2 wire knock sensors utilise the second wire as a shield and a signal ground reference. Typical faulty knock sensor symptoms. Engine warning light on and fault code logged. Reduced engine power. Typically, a faulty knock sensor may retard ignition timing as much as 20 Deg which is experienced by the driver as poor performance. The retard amount may be visible on a suitable scanner. Typical causes of failure for knock sensor. Internal Knock sensor short circuit. Breaks in knock sensor wiring. This may be due to many sensors located under the intake manifold and the wiring becoming brittle over time due to heat. 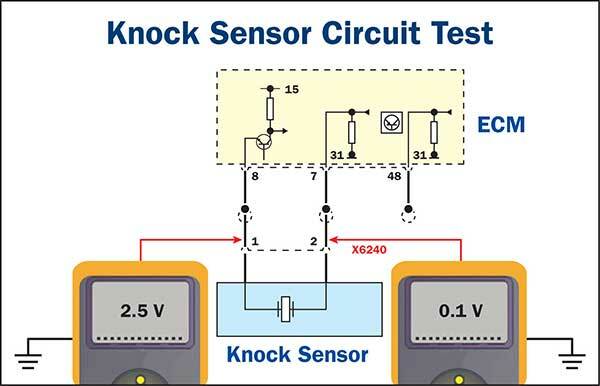 Typical knock sensor and circuit test with Multimeter. Check for open/short or grounded circuit on wiring from knock sensor to PCM. Monitoring knock sensor signal with a Multimeter is not accurate and not recommended. Checking Bias voltage. Many single wire circuits and some 2 wire circuits utilise a 5V Bias voltage from the PCM to the knock sensor and a bleed resistor internal of the knock sensor. This can be checked when the sensor harness is disconnected and the 5V is evident at the harness terminal. Reconnecting the harness to the sensor should drop this voltage. This drop amount is vehicle specific, but a typical example may be 1.5V or 2.5V. If this drop is not evident, the knock sensor may need renewing. Typical 2 wire knock sensor circuit with Bias Voltage – 2.5V with sensor connected. (other wire ground). This sensor has a flat frequency response over the 5 to 18 kHz range. Identifying the types is important prior to carrying out detailed knock sensor circuit tests. 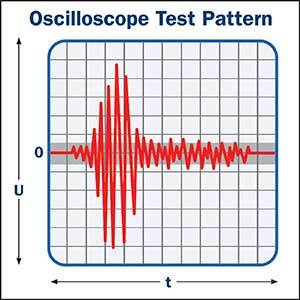 Typical knock sensor and circuit tests with suitable oscilloscope. Ensure fault codes are identified. Ensure excessive engine noise is not the cause of suspected knock sensor fault codes or performance results. Location of knock sensors may create connection difficulties. Need to determine if Mass Piezo type or Resonance type Sensor. Tapping near the sensor is useful for Mass Piezo type. Resonance type sensor may require fuel mixture leaning to create detonation to monitor signal. Knock sensor and circuit specific typical fault codes. P0334 Knock sensor 2 Circuit intermittent Bank 2. The Premier Auto Trade Sensors range includes more than 85 Knock Sensors (KNS), covering over 8.5 million vehicle applications in Australia and NZ.